Recently, Tetsuya Nomura spoke with Dengeki PlayStation about the current development on Kingdom Hearts III. Some of the information is repeated which you can read here. The Frozen level has weapons like ice skates and other ice related weapons. Nomura wanted realistic graphics for the “Pirates of the Caribbean” level. He also wanted Sora to be a pirate this time around. The Pirates level will have a lot of “land, sea and air” elements to it. Sora’s Pirate keyblade transforms into a Spear and a Flag. Baymax and the Big Hero 6 world should be able to be shown off next time they reveal information about the game. The Rock Titan and Toy Story worlds were chosen for the KH Premiere event due to how close they were to production quality. Impressions from fans and the media that played were about the camera which is being reworked from scratch. The difficulty was somewhere between Beginner and Standard mode. Character progression for Sora will be similar to the ones used in Kingdom Hearts I and II. 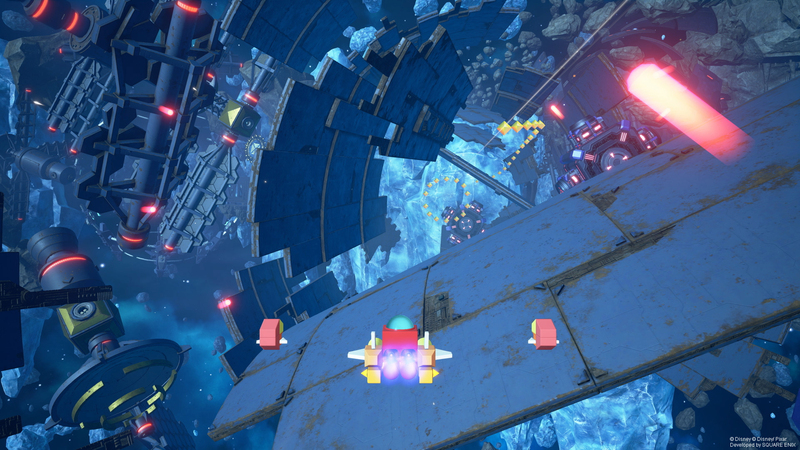 Gummi Ships will feature both a free-movement “open world” mode, as well as standard battle mode. Development of the Gummi Ships is handled by the Einhänder staff. Gummi Ship customization is being worked on. The order in which you play the worlds is close to being decided. There are no optional worlds this time around since most people play all of the worlds anyway. Online elements aren’t in the game but are considered to be added. A demo version of what was showcased at the Premiere event and E3 cannot be produced at this time. Organization XIII information will be released over time. “Tie up all loose ends” is the goal for this game which means many character appearances. Utada Hikaru’s song has been prepared at a very early stage. Nomura passed along information about the series and the details of the game to produce the lyrics for the song. The PS4 Pro Bundle has been in the works for a long time. The leather style has been reworked many times to get the right coloring. The controller has a glossy finish and a design on the touchpad which hasn’t been done before. Nomura wants you to play Union Cross and the past games up until the release of Kingdom Hearts III. Due to the game potentially not fitting all on one disk, Nomura says to prepare for a potential download. Nomura also mentions that Final Fantasy VII Remake development has been perceived to be going badly due to false reporting by various media. He assures that the development is proceeding smoothly and the pace has picked up steadily. Kingdom Hearts III‘s release however is their priority, which is why they haven’t been releasing a lot of news. Nomura is looking forward to when they can release more information regarding the Remake, so he asks fans to please wait a little longer. Kingdom Hearts III is scheduled to release in Japan on January 25, 2019 and in North America and Europe on January 29, 2019 for PlayStation 4 and Xbox One. I just wish treasure planet and more FF or WEWY characters can be bigger parts of the big battles. At this point when they go to Radiant Garden will we not even see Squall? Hope so. At least him. Never realized any of the worlds were optional in the first place. Except maybe the battle coliseum thing in BBS. Also had no real issues with the camera in the demo at E3, dunno what other people had issues with. I believe it was mainly addressed at Rock Titan because of how cramp the area you fight him in and also when attacking the head. We weren’t at E3 or the Premiere event so I can’t speak for how it was unfortunately. Ah. I was dumb when I played I went straight to Toy Box while everyone else started off with Rock Titan. Titan puts you straight into the fight, Toy Box is like 8 minutes of cutscenes before you get to start playing heh.